After four years of studying the use of drones to inspect roof damage, an FAA policy change and Kespry's UAS technology led Farmers Insurance to introduce UAS for commercial operations. Safety and faster claims for customers are among the advantages. A newly-released study by RAND Corp. offers insight into the impacts of drone delivery over urban settings. The study assesses infrastructure requirements, aerial congestion and privacy along with other elements. FlightWave this week announced its Edge unmanned aircraft, a vehicle designed to provide customers with a long-endurance, cost-effective platform capable of flying remote missions in difficult conditions. It can also carry a wide variety of payloads. California-based AirMap is bringing its unmanned aircraft vehicle traffic management system to Kansas. Through a partnership with the Kansas Department of Transportation, AirMap will deploy its UTM system across the state. 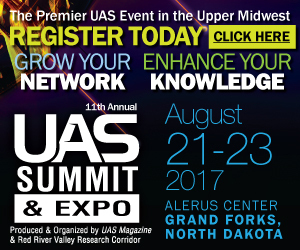 At this year's UAS Summit and Expo, Clear-Com, the global leader in real-time communications and connectivity solutions, will present its highly-scalable voice communications solution for the first time. Researchers at Sandia National Laboratories are finding that weather and climate data gathered from UAS can be used to compliment data gathered from tethered weather balloons. They plan to use this combination to collect data on the Arctic.